It was a cold winter morning when it all happened. I was lying half asleep when my husband began to rustle his legs. I said Larry what is wrong? He said I don’t know and sounded slow and groggy. I jump out of my side of the bed and turned on the light just as I heard a loud bang as if an old trunk had been dropped. I raced around to his side of the bed to find my husband was having a stroke. I called for help and after we got him to the hospital I was told his stroke was so massive that he may not live and that a large part of his brain had been affected. The doctors told me we would have to wait but that the left side of his body had been deeply affected. The sadness of that information was the fact that Larry was left handed and a computer programmer. Larry was starting to improve but his left hand was still in fist position. It was clenched so tight that, with both hands, I could barley open it only for it to shut tightly again. Larry was in rehab and worried he would never use his affected hand again and thought that his life, as he knew it, was over for good. One of the occupational therapist had mentioned that Larry may be a candidate for a cutting edge product called the SaeboFlex. The first time Larry used the SaeboFlex, it was much more than we could have hoped for and we knew we had to get him his own. When Larry’s SaeboFlex arrived he had the people at S.S.M rehab put it on him. They taught him how to use his hand with the device. In a matter of days, Larry was opening and closing his hand with the aid of the SaeboFlex. After only four months, Larry was able to open and release his hand without the SaeboFlex and he is able to transfer objects without the aid of the device. It has been over six months since he has needed the SaeboFlex and is now practicing bouncing and catching a tennis ball with his left hand along with the other stimulating exercises to keep him going forward. It is still a bit of a struggle to write but Larry is writing and eating with his left hand again. 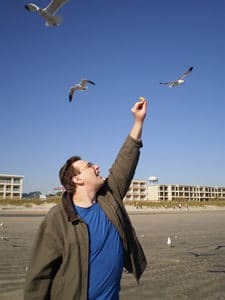 We went to South Carolina this year because last year it was all about the hospital and rehab, but this year Larry fed the sea gulls with his left hand. I would say to everyone to reach for your goals and someday soon you too may reach for the sky. Thank You Saebo for giving my husband a better quality of life after his stroke than we could have ever imagined.